Best Fantasy 2012 - The Goodreads Choice Awards! Wow! Many thanks for all your votes. King follows Prince into the finals of the Goodreads Choice Award - Best Fantasy 2012! Princeof Thorns came 10th last year with ~1000 votes. 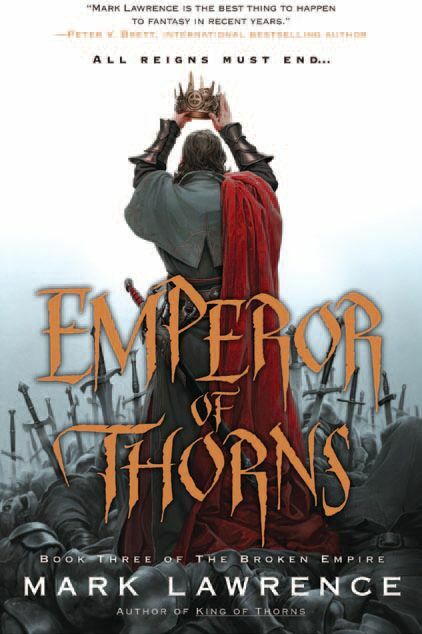 So if you can find it in your heart to stop King of Thorns coming last in the final ... then vote here! Fifteen moments of fame . . . I added a book, The Lone House Mystery, to the Goodreads database recently. Congratulations, you’re on your way to being a forgotten author. That's what this book tells me. 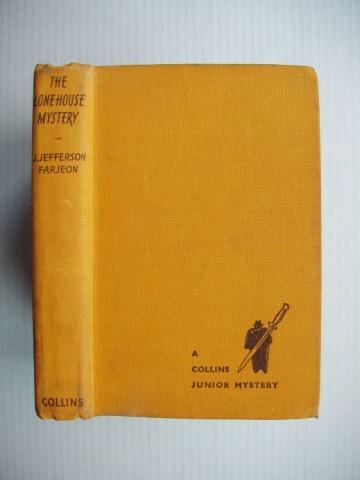 As a child I read and enjoyed (several times) a book called The Lone House Mystery. If it had a dust jacket it was long gone when I got to the book. The front cover declares it ‘A Collins Junior Mystery’. The spine reports the author as one J.Jefferson Farjeon. Shortly after joining Goodreads.com I tried to find the book in their database (containing millions of titles) and rate it. It wasn’t there and none of the 11 million members have added it to the list of books. It wasn’t until I rediscovered the book on our shelves at home recently that I was convinced I’d got the details right. But I had. Inside the front cover in my mother’s handwriting is a large declaration of her ownership with a painted boarder. She would have been quite a small girl when she got the book new in 1949. Joseph Jefferson Farjeon was always going to be a writer as, born in London, he was the son of Benjamin Farjeon who at the time was a well-known novelist whose other children were Eleanor Farjeon, who became a childen's writer, and Herbert Farjeon, who became a playwright and who wrote the well-respected 'A Cricket Bag'. The family were descended from Thomas Jefferson but it was his maternal grandfather, the American actor Joseph Jefferson, after whom Joseph was named. He was educated privately and at Peterborough Lodge and one of his early jobs, from 1910 to 1920, was doing some editorial work for the Amalgamated Press. He also wrote a number of plays, some of which were filmed, most notably Number Seventeen which was produced by Alfred Hitchcock in 1932, and many short stories. When he died at Hove in Sussex in 1955 his obituary in The Times wrote of his "deserved popularity for ingenious and entertaining plots and characterization". So, 80 books, obituary in the Times, a play for Hitchcock, born of actors and writers, descended from Thomas Jefferson ... and the 11 million members of Goodreads have given 10 of his 80 books a grand total of 11 ratings. Time is the fire in which we burn and also the tide that drowns us. Extraordinarily few writers are noticed at all and the vast majority of those are lost from memory with the passage of five or twenty-five years. Sixty-some years has all but erased J.Jefferson. So. I read his book again. I started reading it to my daughter but she got bored – it is rather dry and dated – and since it’s short and I knew the story I finished it for my own nostalgia. The book was written and set very soon after the war. Three posh children outwit common and vulgar crooks. It has some similarities with Enid Blyton’s Famous Five in that respect. The book isn’t without charm or imagination though, and I do enjoy the ‘rather’, ‘do be a sport’ ‘I say’ ‘keep your pecker up’ ‘jolly rotten’ etc. The strong moral messages and reiteration that our three children are made of the right stuff are ... directed at children. Nobody here is complex except perhaps for a repentant thief – it is a children’s book after all and it was entertaining when I read it in 1972/3/4 less so now. The plot is implausible and discordant notes are struck when the crooks produce pistols and shots are fired and our children blithely carry on defending the house they’re ensconced in with a hose pipe. Possibly the proximity to the war put a different perspective on things at the time ... I don’t know. It seems bizarre now – as does the curious lack of emotion from their family who lose them from a train into a snow storm and don’t find them for three days. Most would expect the thaw to reveal frozen corpses . . . In the end, putting nostalgia aside, I’ll give this 2* for ‘ok’. It has dated, and it’s too dry for today’s 8-12 year olds who have so much else on offer, and too shallow for the 13+ who might read past the old fashioned language. So back on the shelf it goes and J.Jefferson’s shade can slip back into the nameless horde of thousands of other popular authors who we’ve forgotten that we forgot. This post is an observation about the critique of fantasy (or more broadly SFF). It might be described as a complaint, and will surely ruffle feathers if it manages to penetrate the circles I have in mind – an unlikely event given their inward-looking nature. What this post most assuredly is not is a complaint about a specific critique or about the common or garden type of critique that seeks to tell the reader what a book’s about and to share the critter’s enthusiasm or distaste for the end product. The vast majority of bloggers who critique books are just telling it like it is, performing a useful service for other readers who want to spend their book dollars effectively. I’m addressing a largely different beast. I’m talking about intellectual criticism. The sort that seeks to dig deeper, go past the plot, link the work into the wider world and traditions of literature. If that’s something with zero interest for you then it’s probably best to bail now. Here’s picture of some ruffled feathers to reward your efforts. So, a serious critique of a piece of literature can look at many things, including: relationships, the internal landscapes of the characters, themes, plotting, narrative arc, narrative voice, conflict, etc. A mixture of mechanics, thematics, and also the societal and existential dimensions. We’re taught this in our English classes at school. In university things become deeper, more involved, but it’s more of the same. When literary criticism lines up the classics of literature in its sights it employs these tools, it seeks the meaning behind the words, between the lines. Generally genre fiction is not targeted for intellectual criticism of this nature. It isn’t deemed worth the effort. The topics that might be focused upon by such critique are held to be absent from the work. Even fantasy, the king, queen, and footman of genre writing, is regarded thusly. Mostly. There is now (and perhaps has been for a while – I am no expert, simply someone with an opinion too large to keep in his mouth) a school of intellectual criticism targeted at fantasy. This school of criticism is armed with a hammer. That hammer is societal deconstruction. There is a mentality that expects (nay demands) that each SFF book is a tightly wrapped social commentary, a distorting mirror of our society crafted with the sole point of making socio-political points, usually to educate the unwashed masses through parable in the business of how society should be. Thus every fantasy story whether it be about bugs or robots or whatever, is really an agenda either supporting or making war on the pundit’s world view. The critiquer’s goal is to beat each book placed before them with the hammer of societal deconstruction until it yields its secret agenda. These dwarves are jews and Tolkein is a racist! These robots are a metaphor for women and their treatment is problematic. These actual women are actual women and their treatment is problematic – which must be what the book seeks to propagate. Et cetera. Why is the diverse and rich output of many intelligent and skilled authors being repeatedly hit with a hammer for meaning when the toolbox is crammed with instruments far more suited to the purpose in many cases? It seems to me that, in part because of this poverty of tools, the intelligensia of genre critiquing mistake complexity for depth, applaud the compression of philosophy into aphorism, and only see subtext when it's monologued 'to camera' by the protagonist. I only have a narrow window on the genre, on genre criticism, and on literary fiction - but it seems to me that the critiques that try to reach beyond the plot in genre critting are looking for social messages rather than for the 'open questions asked about the human animal' that literary fiction poses. Possibly this is a relic of a bygone era when science fiction (particularly in television (such as The Twilight Zone)) would be used to discuss issues such as racial oppression and gender roles which would not get aired in any other format. Today a great deal of critique is focused on feminist deconstruction of genre writing. Many SFF books do contain or even focus on social commentary – both through the desire of the author and likely in response to the understanding that this is how they will be read. We may not have censorship in the same way now, but these approaches allow the subject to get under people's guards before they impose their knee-jerk responses. It’s all good – I’m certainly not trying to say this kind of book is not out there or to stop people from discovering what its subtext is. However – this is not the be all and end all of what fantasy books are about nor the totality of how we may critique them. To me it’s far more interesting and appropriate to address existential issues in fantasy - we are human when removed from our society - human when deprived of our history - it takes more skill and reveals more truth to place a human in alien environs and explore them. Separate a man from the familiarities of class and society - build a new world around him and see what he is then - that raises more questions about what we really are than offering a slice of him in suburbia. The deeper themes in much good fantasy are about what happens within the confines of one person’s skull – existential stuff – the enduring stuff of classic literary fiction – not the transitory business of social structure which holds far less interest for me. The game of deconstructing every single story for its social message is one that bores me. We might hope that literature as a whole gives good messages about equality and diversity. It’s not the task of every single book to make that its raison d’etre within the slim confines of its covers. Can we not declare our genre worthy of full inspection, capable of bearing any message and exploring all dimensions, interior and exterior. Could our conventions widen the focus from 'gender in genre' and 'diverse sexuality' panels and spread their nets more widely? Could our literary elite look for a little more depth than yet another strained attempt to reiterate contemporary society’s issues in an alien culture? Could we not set down that hammer just once in a while and maybe use the screw driver or the drill? I do realise of course that the very first and most predictable response would be to turn all those devices upon my own work and parade it as lacking in all other regards too – but that’s really not the point. Just because all you’ve got is a hammer doesn’t make me a nail.